I’ve done it…We’ve done it! We have now spent our first Fourth of July here as a family. I’m glad it’s come around at the ten-month mark rather than early in our time here simply because we’re more acclimated and we’re in the groove of life here. 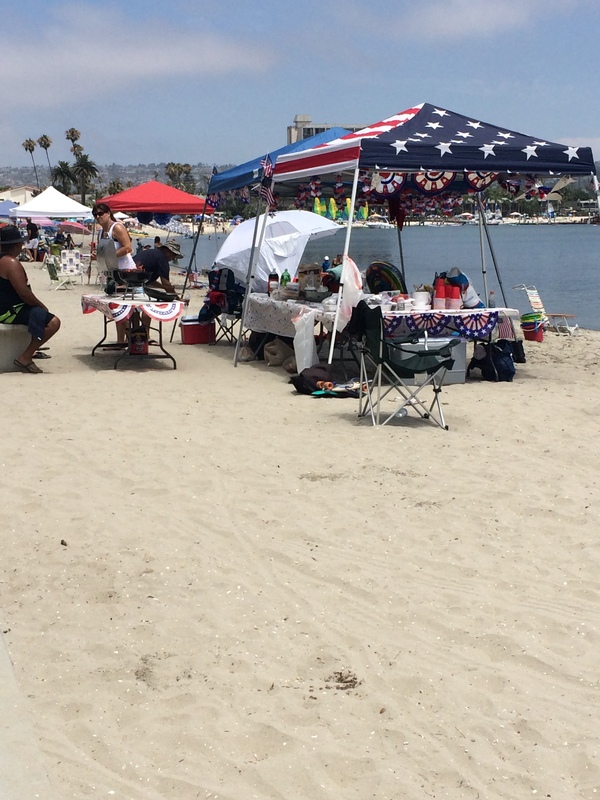 This way we get to appreciate the holiday rather than being freaked out–overwhelmed–by the sea of red, white & blue. Australia Day in Sydney and Melbourne & the Fourth of July in LA are not dissimilar celebrations–it’s summer, many celebrations take part around the beach and there are fireworks. We spent our Fourth of July at a friends’ insistence in Mission Beach, San Diego and I’m so glad we followed her advice. I really miss the kids having freedom to walk to the park, beach or corner shop without me having to accompany them. Over the four days we were there they were able to do exactly that. It was sooo liberating. But while the fourth of July is similar here as it is at home it’s also different: same, same different as we’d say in China. It’s so same, same different in fact that it’s hard to articulate why. Firstly I would say that Americans seem more patriotic and they’re not afraid to be: they put it all out there: their American flags, dress in stars and stripes, paint their nails and even dress their homes. But we do too. We’ve got our Australian flags, flag bathers and throw parties but maybe stop at decorating our nails and houses. 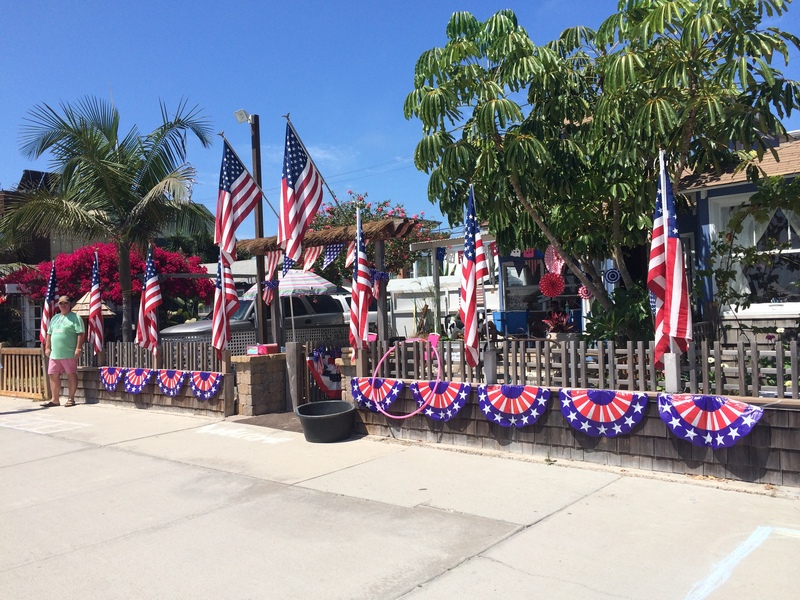 The impression I get is that the fourth of July revolves around community-based activities whereas our celebrations tend to revolve around parties with friends. So even though we were “grilling” at a friends’ house we were also on the beach and interacting with others. Many communities hold parades or fairs so everyone gathers in the same place. I love that because the atmosphere is so electric. And everyone is so bloody friendly. A set-up the envy of many including the beachside “grill”. Not unlike us festivities start early–we saw a group doing shots at around 11am and still going around 2:30. But they weren’t going in the late afternoon as they would’ve been doing at home. But starting early in America seems to also mean pacing yourself (a foreign concept for many of us Aussies). The ability to practice the art of “pacing” lies in not always having a drink in your hand. It also means hanging by the beach with the kids, going on a bike-ride up and down the boardwalk or chatting with fellow revellers. Novel huh? I quite liked it truth be told. Perhaps the biggest difference though is the LA element. Once all the fireworks were done everyone went home. To the Americans the fireworks were the grand finale and signals time to go home. To Australians it signals the end of formal proceedings and time to start partying. Which is usually, I have to say, when the trouble starts. By our standards it’s an early night but here it’s the end of a fun day out. And it ends in fun rather than drama or alcohol-fuelled incidents: we don’t have an off button (design flaw?). 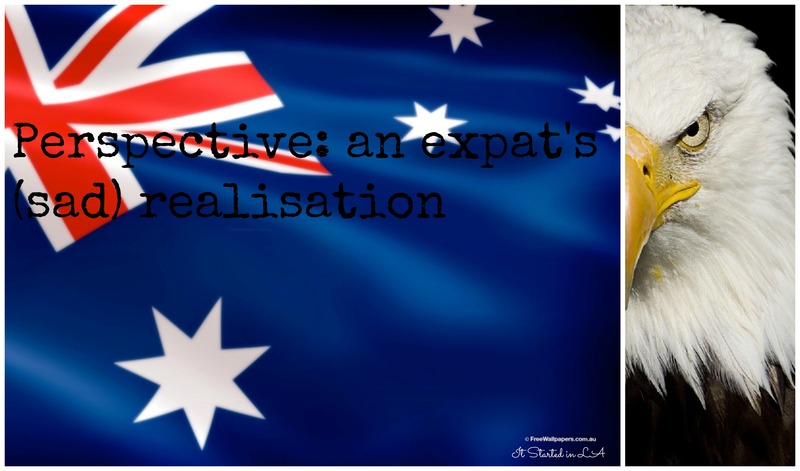 Maybe as a new Ausmerican we can work out how to get somewhere in between…? I’ve already blogged about our weekend away at Coronado Island when we first went to San Diego in April but I really wanted to talk about what a great spot Mission Beach is to holiday. Freedom to wander and walk (and bike) practically everywhere, such a nice change from the “get-in-your-car-for-everything” mentality of LA. Also for our older kids we can give them the freedom to walk to the beach and the park on their own. Watersports galore–jet skis, water skiing, wake boarding, paddle boarding, you name it it’s there. If you feel like indulging yourself try the Hot-tub cruise boat. Hang by the beach … of course. Head around to Mission Bay and go crazy on water sports rental. The Bay is perfect for recreational activities. I recommend the Hot Tub Cruises ;). Hire bikes or a segway. I need to tell you Segway riding is not as easy as it looks but it’s fun once you get the hang of it. I just wish they’d lower the riding age because the kids love it. 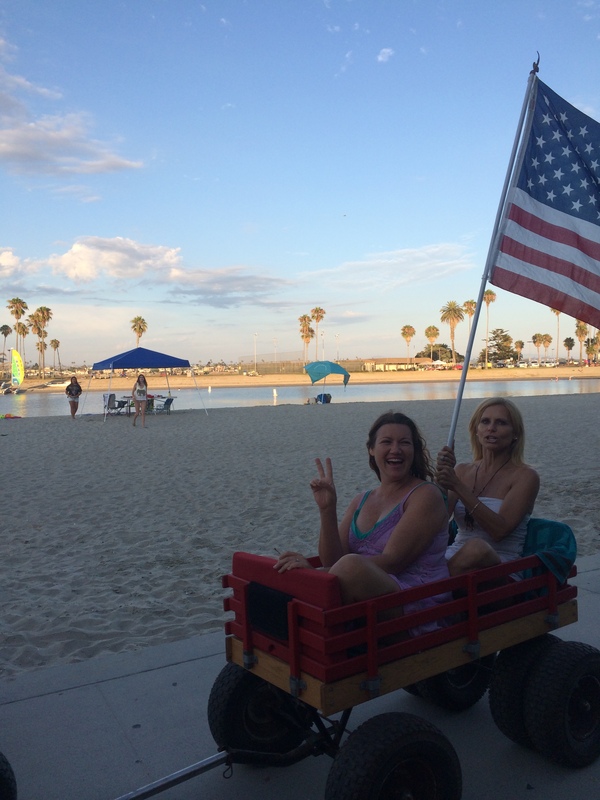 Hire bikes from Cruiser King on Mission Blvd and we got our Segways from the Catamaran. Book a fire pit by the beach (complete with Adirondack Chairs and Tiki torches. Fabulous. Now there’s no excuse not to roast marshmallows and make smores. Relax and let the kids exhaust themselves on activity overload–a perfect recipe for a great night’s sleep so you can do it all over again. We stayed at the conveniently located Catamaran Resort and Spa is in the Bay. Having the pool is a great option (especially for pool-side cocktails) and the kids love the Arcade with complimentary gaming. 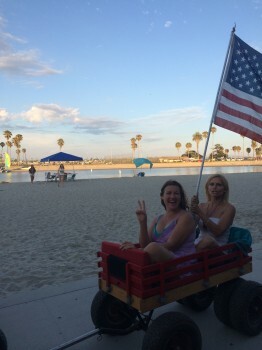 I think we’ll be getting in early and booking our spot in Mission Beach for next year’s Fourth of July. Can’t wait!